You will find a brand new addition to our HOT SPECIALS sections selection of 65MN Steel Swords brought to the market by our good friends at Ryujin – but this time instead of a Chinese style sword, the newest addition is a cool looking, amazingly affordable Gladius loosely based on the historical Tiberius Sword. While the fittings have been used on stainless steel blades for several years – Ryujin has shaken things up by adding in a sturdy 65MN Spring Steel blade – and the best part is, our price is the same as what many other companies are selling the stainless steel version for – just $129.99! Simply great value, stock is limited so get in while the getting is good! They are perhaps the most anticipated swords of this Spring – and they are finally here. Well, almost.. The shipment is in Savannah at the time of this blog post and so only days away from being unloaded, NOW is the chance to secure one before they are all snatched up – for not only are they marked down in price at the SBG Sword Store, but shipping is FREE (though the downside is, we are only able to ship out the swords to US based addressed). The first of the two new swords in the A.P.O.C. 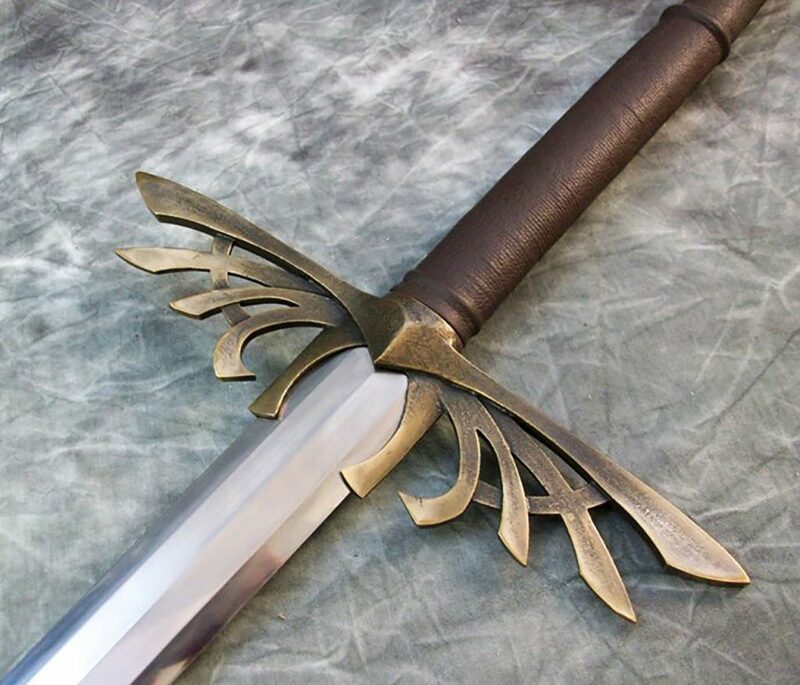 Tactical Series is the so called Survival Broadsword – Gus Trims take on a tactical double edged blade designed for close in quarters fighting. With free shipping and limited opportunities to secure them before they are sold out, at our prices why not get both!? 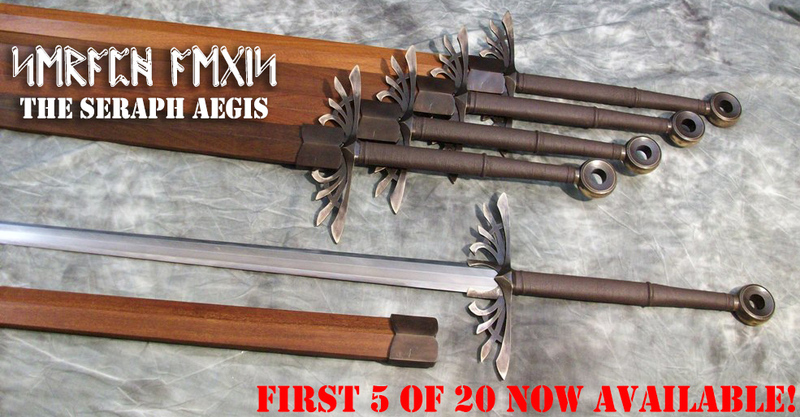 Final Pricing Adjustment to the Seraph Aegis (back down to $2999.99)..
That first one at the front is gone, the other 4 still for sale at the time of this blog post was made.. Unfortunately, this beautiful sword has been having a bit of a tough time finding its feet. The original plan for its release was to occur just before Christmas, and price them as low as we possibly could (which is $3,000) to sell those first 5 of 20 and get Micheal and Jeffrey back to work on the next 5.. Though it was no-one’s fault (the bare blades arrived late) the timing of the release of the Seraph Aegis Sword – after Christmas instead of BEFORE Christmas (and right in the middle of the uncertainty of the US government shutdown) was indeed less than ideal..
For as long as possible, we kept the price down at $2,999.99 (our bare minimum). But finally last month raised it all the way up to something closer to what other sellers would do – $3,850. They might not sell as fast at that price, but honestly even at $4K – with so few being made, the unique quality of the blade and the amazing way its all mounted up for all time – even at $4-5,000 it would still be worth buying (and those kind of profits could REALLY be put to good use to help offset the costs of the Legendary Swords Project itself)..
A limited Edition Blade Easily worth $4-5K..
At the end of the day though, its not really fair to put the price up like that – one person has already purchased one at the special price and a few more are very close to buying if we can offer them a price closer to the original sales price or a payment plan.. So let’s keep our BEST price our only price – and so to make a long story short, the Seraph is back on sale for $2999.99 with free worldwide shipping. It depends on how long they take to sell out on when and if there will be another run of 5 – but that’s a long way off even if we started work today. Back to our best price with 4 swords and counting.. Phase 2 Megasale – Hanwei Medieval Overstock Sale! This sale is rather unexpected, but with a new shipment of swords fresh from the forge due next month, the official distributor for Paul Chen’s Hanwei Forge swords – Cas Iberia – are offering their vendors big discounts until the end of the month. We weren’t expecting it, but the deals are so good we had to pass them on. 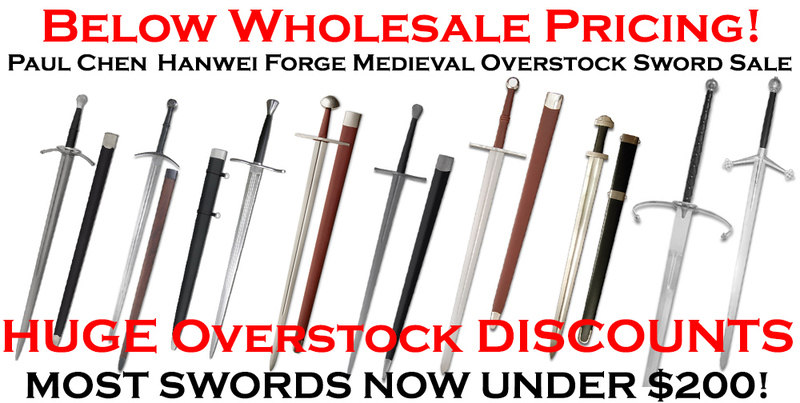 So here it is, below wholesale special pricing on ALL the medieval swords we have in stock from Hanwei – 10 swords total, and with the discounts most are available for just under $200! At these prices, the most popular swords are sure to sell out fast – and there are some real beauties in there. As you know, our every day prices are well below the MSRP, and with these discounts save you an additional 20% off! Have a look and see what is on offer, you will be glad you did. We last offered it up for sale in May last year, and here it is again – pricing well below the usual cost/wholesale pricing with FREE SHIPPING on this traditional and very attractive practical cutting Katana by the artisans at Dragon King. Currently below cost sale price gets you this $900 sword for less than half price.